For the past 16 years, sisters Gladys and Jamie Scott have been serving life sentences for an armed robbery during which $11 was stolen and no one was seriously injured. Believe it or not, that is only the second most shocking aspect of this story. 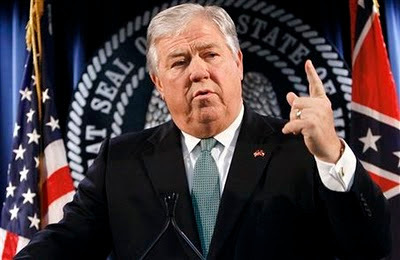 Mississippi Governor Haley Barbour, fresh off a scandal that damaged his presidential aspirations, recently authorized the women's immediate release under the condition that one would agree to donate a kidney to the other. Jamie Scott was released due to her ill health - she requires regular dialysis, which costs Mississippi $200,000 per year. The idea to leverage her sister Gladys' release with an obligatory kidney donation (pending tissue compatibility) allegedly came from Gladys herself and the civil rights lawyer representing her. This peculiar arrangement came in the context of the NAACP's aggressive campaign to free the African American sisters from an excessive punishment tinged with racial discrimination. In a self-serving response to this pressure, Barbour announced that Jamie Scott's debt to society has been paid, and, oh yeah, that the state will no longer need to pay for her expensive dialysis. "The Mississippi Department of Corrections believes the sisters no longer pose a threat to society…their incarceration is no longer necessary for public safety or rehabilitation, and Jamie Scott's medical condition creates a substantial cost to the State of Mississippi." As for Gladys' release, the "kidney-for-freedom" barter seems to serve two purposes. For one, quelling the uproar from civil rights groups would require that both sisters, not just one, were released. Secondly, the deal lets the state avoid the image of "kicking an ailing woman 'to the curb'" to cut costs by letting them legally co-opt an organ "donor" onto the operating table for her. Many critics have rightly claimed that the two issues at hand - the sisters' imprisonment and Jaime's need for a kidney - should, and in fact must, be addressed independently. Bioethicist Arthur Caplan points out that legal organ donation, which must be voluntary, requires that the donor be "free and clear to change [his or her] mind right up to the last minute." Making organ donation the cost of a prisoner's freedom not only is ethically abhorrent, but also would seem to be clearly illegal. The 1984 National Organ Transplant Act (NOTA) (42 U.S.C. 274e) prohibits any form of "valuable consideration" in exchange for human organs for transplantation. In reference to the Barbour decision, Frances Kissling shrewdly asked, "what could be more 'valuable consideration' than a get out of jail card?" A few years back, the South Carolina senate backed a similarly repugnant proposal to entice prisoners to "donate" organs with a 180-day sentence reduction. Government programs that coerce marginalized groups onto the operating table have taken even uglier forms, especially in the American South. Recall the term "Mississippi appendectomies" coined by Fannie Lou Hamer to describe the state-sponsored forced sterilization of black women in the 1920's and 30's without their knowledge or consent. Ultimately disquieting about the Barbour decision in the Scott case is the fact that civil rights groups have applauded it without commenting on the coercive kidney "donation" aspect. This seems to be an unfortunate case of protecting some important civil rights at the expense of others.